Just now I realized that the I2C data and clock lines (SDA and SCL) must have pullup resistors. 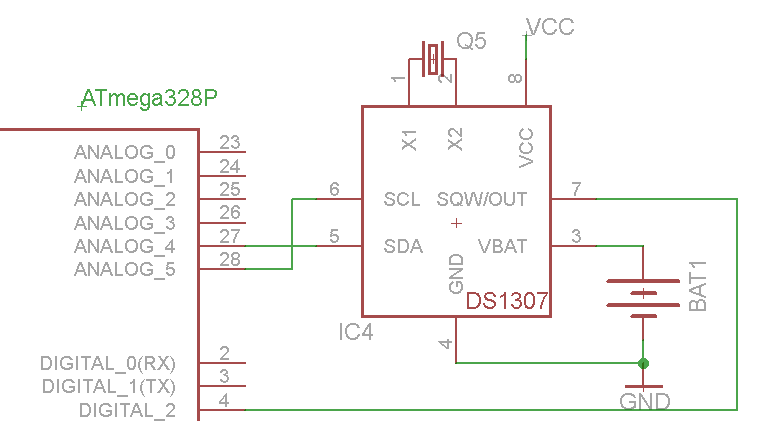 Well, I've built a couple of clocks using the DS1307 RTC (see datasheet) according to the schematic below. Notice that I have omitted both pullup resistors. What happens when the I2C pullups are omitted? Is the lack of pullups likely to damage any of those two ICs in my board? I'm after answers that address my specific case of connecting ATmega328P to a DS1307 RTC like in the schematics I provided, but if the question doesn't get too broad, it would be helpful to know what happens when the pullups are omitted in general, i.e., in other scenarios of I2C operation. PS. I did search the Net to find the answer, but could just find articles about dimensioning the pullups. Update: I'm using Arduino IDE 1.03 and my firmware handles the RTC using the DS1307RTC Arduino lib (through its functions RTC.read() and RTC.write()). That lib in turn uses Wire.h to talk to the RTC. Update 2: Below are a series of scope shots I took to help explain how the I2C is working without the external pullups. Update 3 (after I2C pullups added): Below is another series of scope shots I took after adding proper (4K7) pullup resistors to the I2C lines (on the same board). 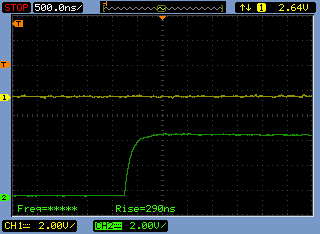 Rise times dropped from about 5 µs to 290 ns. 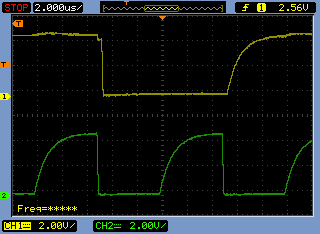 I2C is much happier now. 1) What happens when the I2C pullups are omitted? There will be no communication on the I2C bus. At all. The MCU will not be able to generate the I2C start condition. The MCU will not be able to transmit the I2C address. Wondering why it worked for 3 months? Read on. 2) The lack of pullups is likely to damage any of those two ICs in my board? Probably not. In this particular case (MCU, RTC, nothing else), definitely not. 3) Why was the MCU able to communicate with the I2C slave device in the first place? I2C requires pull-up resistors. But they weren't included in the schematic. Probably, you have internal pull-ups enabled on the ATmega. From what I've read1, ATmega have 20kΩ internal pull-ups, which can be enabled or disabled from the firmware. 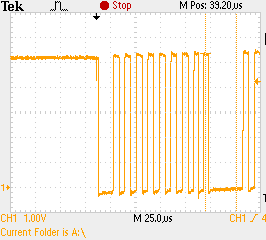 20kΩ is way too weak for the I2C pull-up. But if the bus has a low capacitance (physically small) and communication is slow enough, then 20kΩ can still make the bus work. However, this is not a good reliable design, compared to using discrete pull-up resistors. 1Not an ATmega guy myself. update: In response I2C waveforms, which were added to the O.P. PIC18F4550, Vcc=+5V, 2.2kΩ pull ups. Waveform shows SCL. The rise time on SDA is about the same. The physical size of the bus is moderate: 2 slave devices, PCB length ≈100mm. The library you use, and the libraries it depends on (Wire), enable the internal pull-ups of the ATMega. These are weak pull-ups, and in normal use, supplement any external pull-ups (two resistors in parallel). Due to the relatively high resistance of 20k to 70k, they do not cause much if any issues with external ones in use. Now without external resistors, the weak internal pull-ups are the only thing driving the line high. Depending on your board layout, the speed of your i2c line, how often you access it, external interference, etc, they might work, they might not. You lucked out. You do have pull-ups, just not ones you expected. The lack of pullups is likely to damage any of those two ICs in my board? Even without the internal pull-ups, a lack of any pull-ups will not damage either IC. The internal build of i2c device SCl and SDA lines are like NPN transistors. They are Open Collectors, essentially current controlled/switched diodes. The last thing to note though, having the internal pull-ups on, when your ATMega is at 5v, and the i2c device is a 3.3v only device, can cause issues. Or if you have the internal pull-ups on, and external resistors connected to a 3.3v or other voltage, can also cause issues. Essentially, it's an intentionally ignored bug in the Wire library. Generally you will need to have the pullup resistors for an I2C interface circuit. If the interface is truly a full spec I2C on both ends of the wires then the signal lines without the resistors will never be able to go to the high level. They may remain low or go to some intermediate level determined by the leakage current in the parts at each end. The reason for this is because true I2C is an open drain bus. Some devices may actually have on-chip pullup resistors in the 20K to 100K ohm range just to hold the interface pins at a high inactive level when the I2C interface on the part is not in use. For simple and short interfaces these pullup resistors may be just enough to provide the current needed to pull the lines high while clocks and/or data is being signaled. It is hard to tell from your schematic but in some instances I2C interfaces are implemented using general purpose I/O port pins and then bit banged in software. Sometimes the implementer may not operate the I/O pins in this configuration using an open drain methodology and this may play a factor on why an interface without pullup resistors may seem to work. At the end of the day you probably owe it to yourself to check out the signalling on one of your earlier clocks using an oscilloscope to see if the 1's and 0's on the interface are working within spec voltage levels. Then you will know for sure whether you were just incredibly lucky with that implementation or if one of the factors that I mentioned above is at play. What happens when the I2C pullups are ommited? Most likely, the I2C bus will simply not work. Your I2C lines will not work at all. If I'm not mistaken, I2C just asserts low signals, but does not return them to back to a high state, which is why you need those resistors. Any lack of pull-ups should not damage any IC. I2C is a TTL-logic protocol; so your data and clock lines are open-drain. 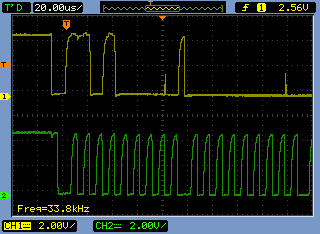 In other words, the I2C hardware can only drive these lines low; they are left floating when not a zero. That's where the pull-up resistors come in. This is a simplified diagram, but work with me for a second. As you can see; the pull-up resistor is needed to ensure a logic 1 is seen at the output when the TTL logic is not driving the output low. TTL logic cannot drive the lines high as I already mentioned. If this were not present, the output would be left floating and it's unpredictable what you may see at the output (for all you know, your microwave or the intestinal dysfunctions of your co-workers caused by a certain sugar-free gummy bear could cause the value to fluctuate). Now, if you were to implement I2C in software with a microcontroller, this would likely not be too much of an issue as it will most likely be using CMOS logic, which can drive outputs both high or low. When I bit bang I2C with a micro as the master which supplies the clock then I have been able to drive the SCL without pullup. However, SDA does need to be OC with pullup so the slave device can pull down and respond properly. Not the answer you're looking for? Browse other questions tagged atmega i2c pullup rtc or ask your own question. Why do we need external pulling resistors when microcontrollers have internal pulling resistors? How to isolate two ground signals? Can I2C work without pull up resistor?